Animal Friends announces that the town of Ludbred banned circuses with animals and hopes that the town of Samobor will make the same decision. Appealing to the citizens of Samobor not to visit circus with animals which currently performs in town and in light of the Ludbreg ban, Animal Friends organizes on Saturday November 7, 2009 at 11 A.M. a protest march for the ban of circuses with all animals in the town of Samobor. 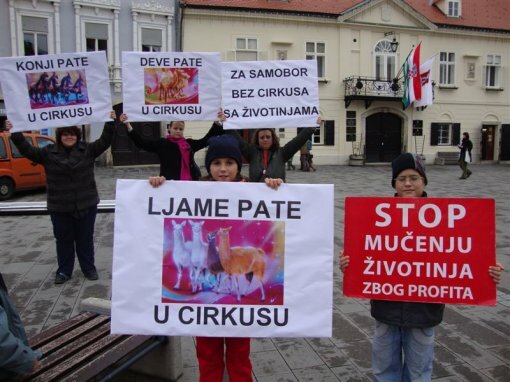 Animal Friends' members and supportive citizens will march with banners on Saturday's Samobor peak time taking a route through King Tomislav Square, Ulica Mirka Klescica, Matica Hrvatska Square, Ulica Josipa Komarea, Mlinska ulica, Ulica samoborskih bratovstina, and Perkovceva ulica, ending again at King Tomislav Square. 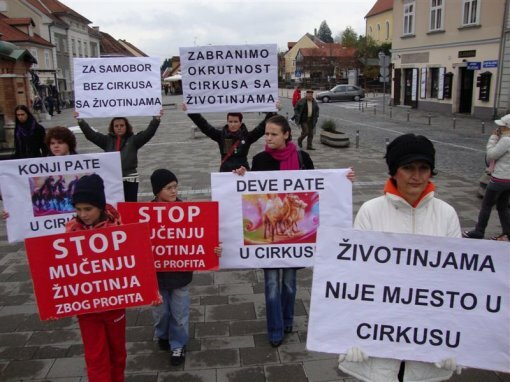 Beside the event in the center of Samobor, Animal Friends will protest on the same day in front of the circus at 3 P.M. and 6 P.M.. Animal Friends sent a request to the town of Samobor to join other towns which already banned circuses with all animals, thus becoming the thirty-first town in Croatia which cares about its reputation, the wish of its citizens and animal protection. Most of their circus lives, animals are kept in chains or locked up in confined places or trucks. They are deprived of food and water so as to avoid a mess on stage. Chained, locked up, lost and often sedated, they wait for training or performance. Whips, electric rods and other "tools" are often used. Domestic and wild animals are exposed to painful journeys from town to town for fun and profit. Because of these reasons circuses with animals are banned all around the world. The Croatian Animal Protection Act bans the keeping of wild animals in circuses while 30 towns in Croatia banned circuses with all animals. Any form of animal exploitation in circuses is not exemplary and it belongs to our outdated and inhumane practice of animal treatment. The circuses of the future are circuses without animals in which people with their skills and art entertain other people. There are more humane ways of entertainment for both children and grown-ups. Children deserve to be taught to respect other living beings and should know that animals do not have fun in circuses and that they should not be kept there. Several reports have been sent to the authorities since the Animal Protection Act regulates the ban of using wild animals according to Article 53 paragraph 1 which says: "It is prohibited to keep wild animals in circuses and use them in circus performances and other performances involving animals." That means that wild animals should not be in a circus, whether they perform or not. Although it is clear to everyone that none of Croatian citizens considers camels and llamas as domestic animals, some people try to misinterpret the law for financial gain. Also, according to the Animal Protection Act circuses cannot exhibit animals under any circumstances to the public (Article 3, paragraph 26). The same law does not allow forcing animals to behave unnaturally (Article 4, paragraph 2, item 11) and expose them to adverse temperatures and weather conditions, depending on the animal species (Article 4, paragraph 2, item 13). The social conscientiousness more and more opposes the exploitation of animals for human entertainment in general, while keeping animals in circuses is considered a specifically unacceptable and cruel way of entertainment. If circuses really want to offer great entertainment, then they should take example of those circuses that design spectacular shows and attract thousands without one single animal.